What is this page? What is a "blog"? Originally meaning "web log," a blog was supposed to be a kind of online journal, a collection of interests, ideas and links. 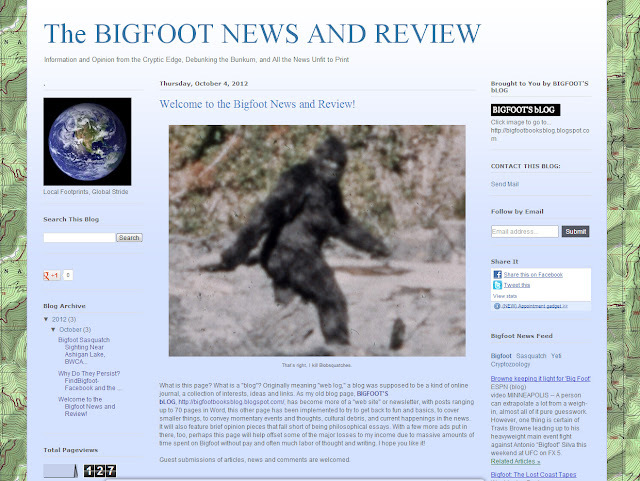 As my old blog page, BIGFOOT'S bLOG, http://bigfootbooksblog.blogspot.com/, has become more of a "web site" or newsletter, with posts ranging up to 70 pages in Word, this other page has been implemented to try to get back to fun and basics, to cover smaller things, to convey momentary events and thoughts, cultural debris, and current happenings in the news. It will also feature brief opinion pieces that fall short of being philosophical essays. 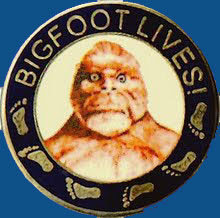 With a few more ads put in there, too, perhaps this page will help offset some of the major losses to my income due to massive amounts of time spent on Bigfoot without pay and often much labor of thought and writing. I hope you like it! This blog will also be a repository for much of the content that I've been posting to the Facebook black hole at: THE COALITION FOR REASON, SCIENCE AND SANITY IN BIGFOOT RESEARCH. You might wish to join there as well to keep abreast of and discuss all thing Bigfooty. 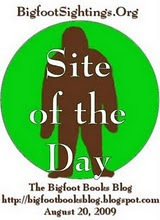 This blog is copyright and all that jazz, save for occasional small elements borrowed for "research" and information or satirical purposes only, 2003-2012, Bigfoot Books and Steven Streufert. Borrowings for non-commercial purposes will be tolerated without the revenge of Angry Bigfoot, if notification, credit, citation and a kindly web-link are given, preferably after contacting us and saying, Hello, like a normal person would before taking a cup of salt. No serious rip-offs of our material for vulgar commercial gain will be tolerated without major BF stomping action coming down on you, hu-man.